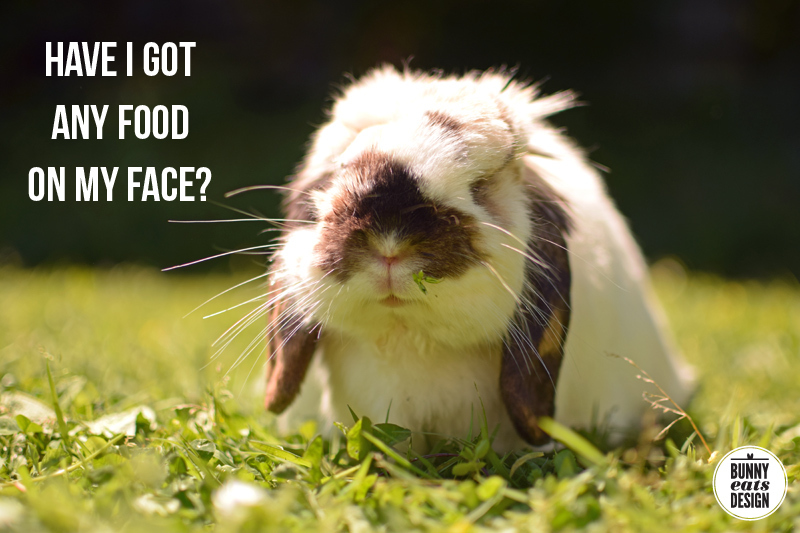 Tofu Tuesday: Have I got any food on my face? Tofu the bunny has enjoyed supervised outdoor time 3 days in a row. We let him out before the 2 weeks of restricted time was up because he’s been healing really well and outdoor time adds so much to his quality of life. Mental health is just as important as physical health! Even with both eyes removed (enucleation), Tofu has no trouble breaking through the barrier I set up to ban him from the kitchen, navigating through the kitchen to the back door, across the deck, down the stairs and into his beloved garden. In fact, he’s broken through the barrier a few times over the last week, even eating the cardboard portion of the barrier for fun. This is the first time I’ve taken photos of Tofu since he had his second enucleation. I still think he is a very handsome bunny. I love to see people enjoying their food so much they don’t care or notice food stuck to their face. This bunny with food on his face makes me giggle. As they say, “If your friends don’t make fun of you, they’re not really your friends”. Glad to hear that Tofu is still king of the garden and navigating well. Thank you. It’s quite surprising how well. A relief too. Awe poor bunny! I’m sorry to hear he had to have the other eye removed. They sure are resilient creatures. I love your blog. This is why I have nominated you for the Liebster Award. The Liebster Award is for bloggers who have less than 200 followers on Bloglovin. The nomination enables bloggers to interact with other upcoming bloggers. Please check my blog for details if you accept the nomination. Thank you Thays. That is very kind of you.